One of the keys to a long-lasting commercial HVAC system is being installed properly. For this reason, you should only hire professional, certified, licensed contractors. Selecting the most appropriate contractor for your needs comes down to answering a series of questions. Here are some important points to remember when choosing your HVAC installer. It’s helpful to research three or four contractors and then pick the one who best suits your needs. Find out who your colleagues have hired. Read online customer reviews about them on sites like Yelp. Contact some of the clients they provide as references. A red flag to work with them is if they cannot come up with any references. The firm should be licensed to operate in your state. Verify the company has a positive reputation on the Better Business Bureau. See what the firm’s rating is. If there are complaints on file how were they handled? One of the strongest indicators of a contractor’s credibility is their website. Does it look professional or just thrown together? A modern, attractive website shows the firm cares about its image. The site should give basic information about the contractor, such as how long they have been in business and the company’s vision. The most reputable firms will make clear the experience and training level of their workforce. The questions you ask the contractor should be based on your specific needs, such as do they specialize in the type of system you seek? Make sure the staff has worked on the type of HVAC system you want to be installed. Using inexperienced installers can void the warranty of the equipment and may lead to reinstalling the system a second time, which can be costly. It’s best to work with a contractor who has served in your area for many years instead of a new, untested company. It’s important the firm complies with local building codes and other government policies. The contractor should also carry insurance to protect its workers so you are not held liable for injuries. Be sure to ask if they carry worker’s compensation! Above all, the company should be reliable at providing excellent service, which can be checked from references. You will learn how interested a contractor is in meeting your business needs by the responses they give to your questions. If they fail to ask you any questions, it could mean they aren’t even aware of the careless impression they are making. HVAC contractors get business by building reputations for satisfying client needs. For this reason, you should see some attempt to understand your goals for quality and deadlines. Prior to installation, a contractor should spend a good chunk of time inspecting your workplace facility to determine what needs to be done to improve heating and cooling. They should be aware of what you are looking for in long-term cost-efficient solutions on equipment expenses and maintenance. 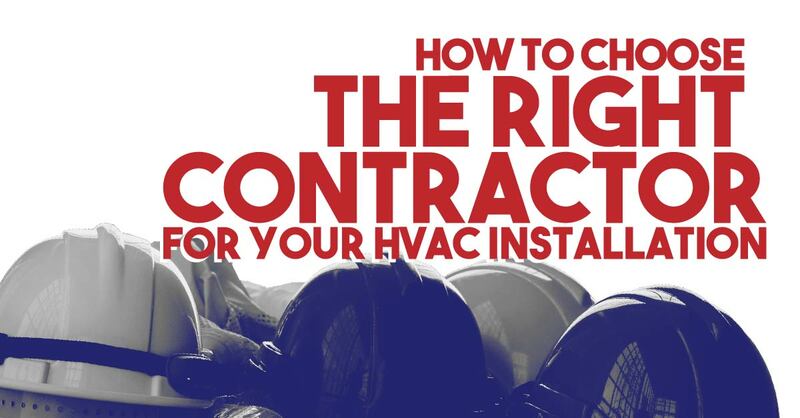 A contractor who cares about your needs will give you proactive advice on how to make your HVAC system run as smoothly and efficiently as possible. One of the differences between a residential and commercial HVAC installer is the commercial installer should be able to offer more customized solutions. Even though residential and commercial systems serve the same purpose, they are much different in size and placement. Commercial HVAC equipment tends to be placed on the roof rather than the ground of a building, which helps reduce machine noise and saves real estate space. Find out which contractor offers the most options and flexibility. The final stage before deciding on your HVAC installer is to get an itemized estimate from each candidate. Compare all the bids with an understanding of the pros and cons of each contractor. Important factors to compare beyond cost and features is energy efficiency and warranty. Sometimes the cheapest bid doesn’t provide the best benefits, so you have to prioritize and weigh all the criteria. Once you know you’ve found the right choice, sign the written proposal to get the work started. Make sure you get the details of the service in writing so you are aware of dates, labor, and equipment costs, as well as any future fees. Finding the right contractor to install a new HVAC system at your workplace requires doing some homework and analysis. The key to a durable system is to aim for a quality installation even if you have a tight budget. Contact us here at A-1 Property Services to learn more about improving your heating, cooling and energy efficiency.